(Sonchus species) Sow thistles are annual and perennial weeds that grow just about everywhere in the garden. They produce lots of seeds and quickly spread to become a problem. Several species of sow thistles – sometimes written as sow-thistle or sowthistle – are common garden weeds. They grow just about everywhere in the garden, making it unsightly. There are both annual and perennial species of sow thistles. 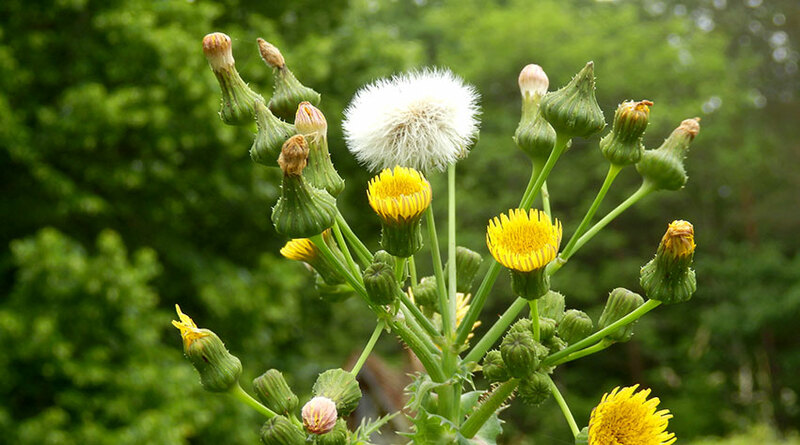 The commonest ones are the annual prickly sow thistle (Sonchus asper) and smooth sow thistle (Sonchus oleraceus) and the perennial, perennial sow thistle (Sonchus arvensis). They all produce lots of wind-blown seeds that easily spread them all over the garden, making them a nuisance and a problem to control. These seeds can remain dormant in the ground for several years. And as “One year’s seeding means seven years weeding”, allowing plants to flower and produce seeds, means several years of trying to control and remove it. Perennial sow thistle can also spread via its creeping roots. Sow thistles are also secondary hosts to some aphid species – such as the currant aphid that attacks currant plants causing leaf distortion – helping to complete its lifecycle and forming a bridging host so that the aphids can then re-infect currants. Sow thistles are in the same plant family as dandelions, and they produce yellow flowers that resemble those of dandelions. 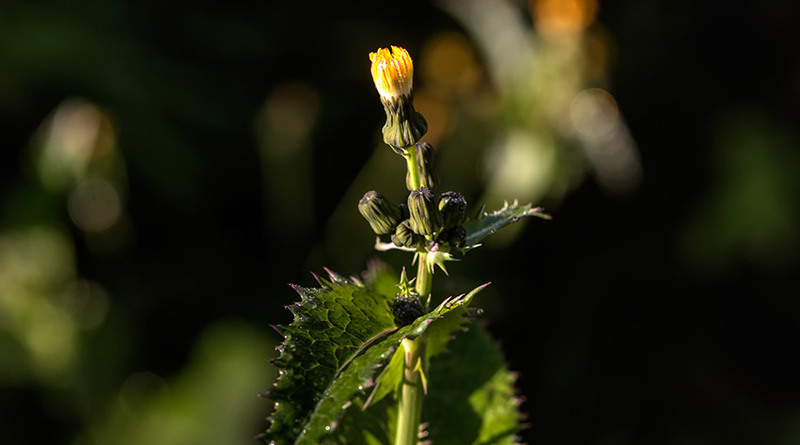 Sow thistle flower stems can reach anything from 30cm (1ft) up to 2.1m (7ft) high, depending upon species and the growing conditions. They are characterised by soft, irregularly lobed leaves that clasp the stem and form a basal rosette, certainly when the plants are young and before they start to flower. The colour ranges from shades of green to bluish and purplish, especially on older plants. Sow thistles produce a milky latex sap when any part of the plant is cut or damaged. The leaves of prickly sow thistle, as its name suggest, are covered in small spines on their margins. As with most weeds, never allow sow thistles to become established. This will make it more difficult to fully control them. Early identification and eradication is very important. Start by digging out as much of the sow thistles as possible, including the creeping roots of perennial sow thistle. In lawns, regular mowing throughout the year and the use of lawn fertilisers and lawn weedkillers should weaken and eventually kill them. You may unknowingly introduce sow thistles into your garden when buying topsoil or manure. So be vigilant when buying these. 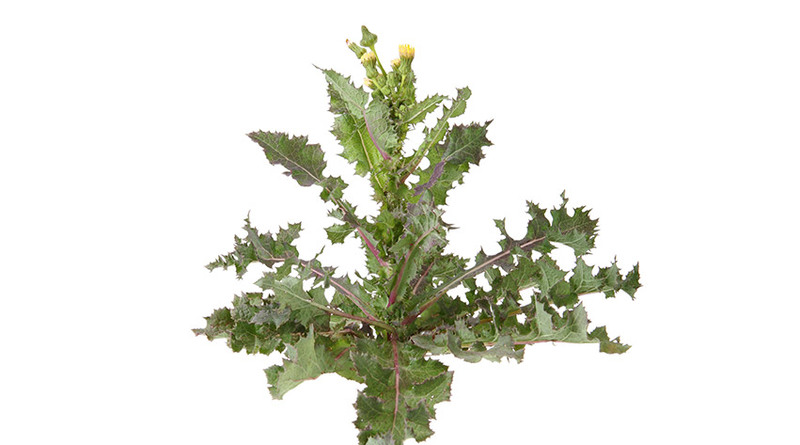 There are a number of weed control options available to treat sow thistles. In addition to traditional weedkillers there are now also a range of more natural alternatives. Any weedkiller can be used to control and kill annual sow thistles in beds, borders, waste ground and on paths. Those marketed as “fast acting” are contact weedkillers – killing or damaging the plant tissue they are sprayed onto or make contact with. These tend to be based on “naturally-occurring” active ingredients, such as acetic acid and natural fatty acids. These will burn off the foliage of perennial sow thistle, but may not completely kill it. Systemic weedkillers that also kill the roots can also be used, and are a better choice for perennial sow thistle. Spray the leaves when the sow thistles are growing actively; this is mainly from March/April to September/October. Plants are at their weakest just before flowering.